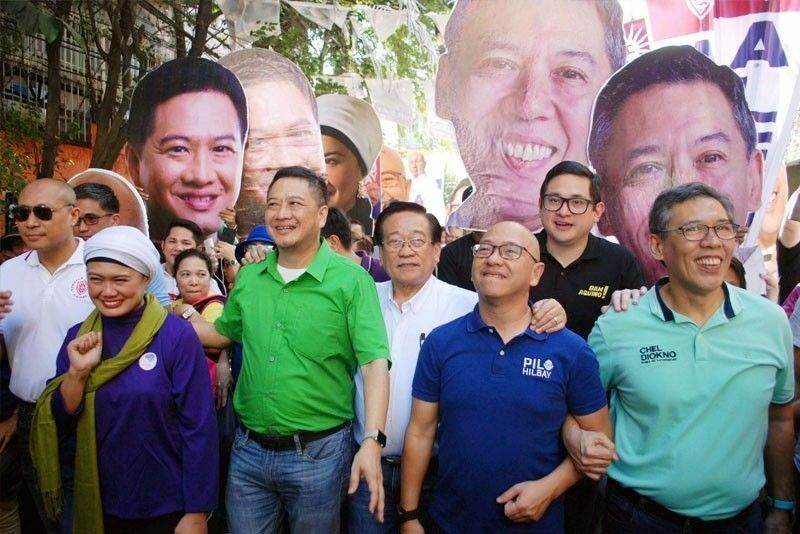 Otso Diretso senatorial candidates (from left) Rep. Gary Alejano, civic leader Samira Gutoc-Tomawis, former congressman Erin Tañada, election lawyer Romulo Macalintal, former solicitor general Florin Hilbay, Sen. Paolo Benigno "Bam" Aquino IV and rights lawyer Jose Manuel "Chel" Diokno campaign in the streets of Caloocan City on March 25, 2019. MANILA, Philippines — Senate aspirants on Tuesday urged the Office of the Ombudsman to look into possible liabilities of President Rodrigo Duterte and other officials over the alleged drug links of former presidential economic adviser Michael Yang. In a statement, Otso Diretso candidates Florin Hilbay, Erin Tañada, Romulo Macalintal and Samira Gutoc raised that the ombudsman has the power to launch motu propio or on its own initiative an investigation over the claims of former police Senior Superintendent Eduardo Acierto. Acierto in a news conference said that Yang is involved in the illegal drug trade. He also showed photos of the president with two Chinese men who are allegedly involved in the drug trade and have alleged links to top police officials. Acierto said that he submitted his report to top law enforcement officials. Macalintal also said that the ombudsman can look into allegations even without a formal complaint filed against them. Marawi civic leader Gutoc, for her part, said that the administration should conduct internal cleansing within its ranks. Presidential spokesperson Salvador Panelo, however, said on Tuesday’s briefing that it is up to investigating agencies to validate the allegations against Yang. Duterte had earlier cleared Yang, whose contract with the government ended in 2018, from drug links and said that Chinese Ambassador Zhao Jianhua even admitted to sleeping at Yang's residence in Makati. Labor coalition bet Leody de Guzman, for his part, raised the alarm that a foreign national with alleged drug links can influence policies and programs of the government. “The fact that the top brass of the PNP and the Philippine Drug Enforcement Agency were knowledgeable of the intelligence report of Col. Asierto, that Yang was operating shabu laboratories in Davao City as early as 2004 and did not act upon it shows that corruption and connivance has reached unprecedented levels,” De Guzman said in a separate statement. In January, the National Bureau of Investigation has filed importation of illegal drugs, graft and grave misconduct complaints against Acierto and 50 other Bureau of Customs officials before the Department of Justice.